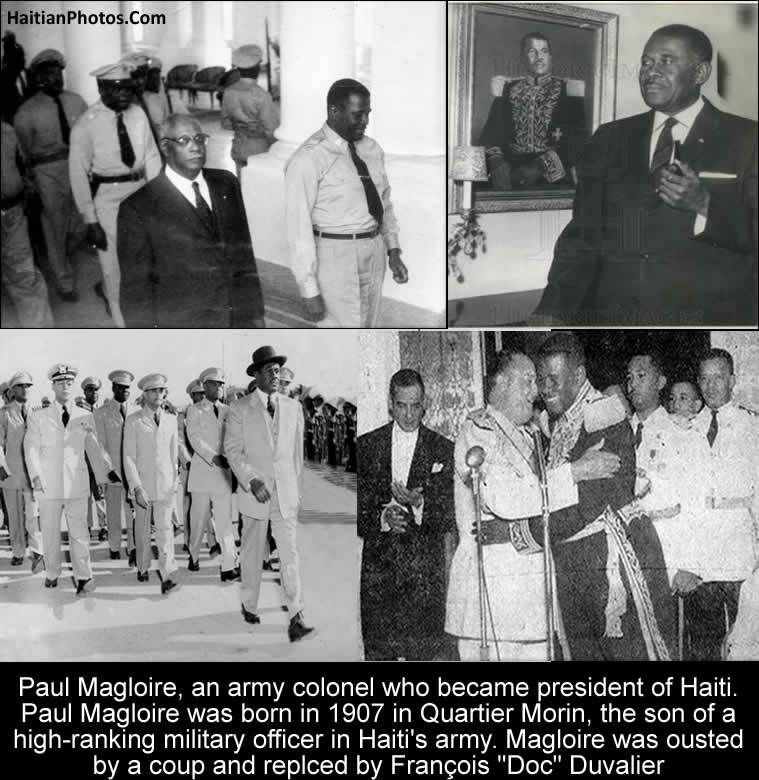 Paul Magloire, an army colonel who in 1950 became president of Haiti. Paul Magloire was born in 1907 in Quartier Morin, the son of a high-ranking military officer in Haiti's army. Magloire was ousted by a coup and replaced by François "Doc" Duvalier. Rafael Leónidas Trujillo Molina (born on October 24, 1891) was a Dominican politician, soldier and dictator, who ruled the Dominican Republic from February 1930 until his assassination in May 1961. Trujillo was killed by a group of rebels determined to topple his regime. He was Dominican President between 1930-1938 and 1942-1952. In 1937, he ordered the massacre that took more than 35,000 Haitian lives on charges of invading the Dominican Republic. It was launched by the army with common criminals released for these purposes against Haitians living in the Dominican Republic's northwestern frontier and in certain parts of the adjacent Cibao region. It was a shameful and brutal event that harmed his prestige in the entire world. Punishment for the atrocity amounted to an agreement in which a paltry US $525,000 was paid to the Haitian government. Haitian President Élie Lescot put the death toll at 12,168; in 1953, the Haitian historian Jean Price-Mars cited 12,136 deaths and 2,419 injuries. In 1975, Joaquín Balaguer, the Dominican Republic's interim Foreign Minister at the time of the massacre, put the number of dead at 17,000. Other estimates compiled by the Dominican historian Bernardo Vega went as high as 35,000. Before the massacre, Trujillo made his intentions towards the Haitian community clear in a short speech which he delivered on 2 October 1937 at a dance in his honor in Dajabón. He accused Haitians on charges of thefts of cattle, provisions, fruits, etc., and thus they were preventing Dominican people to live a peaceful life. Trujillo was a man of bad temper, but had many fabricated justifications of such mass genocide. With the crash of world markets and the onset of the Great Depression in 1929, the price of sugar fell drastically, sugar production was cut, and the Haitian worker was no longer in demand in the Dominican Republic. In 1931, Trujillo took power and began to deport Haitians living in the Dominican Republic using discriminatory and inhuman policy to the Haitians. However, when in the 1950s, when the economic situation became reversed, he took a different tone because, by then he had accumulated about 75% of the Dominican sugar mills and had forced many U.S. competitors out of business. To maximize his profit, he turned to the Haitian workers. In 1952, Trujillo and Haiti's President, Paul Magloire, signed a bilateral agreement in which the Dominican Republic bought 16,500 Haitian workers directly from the Haitian government. These migratory Haitian sugar cane cutters were kept in wooden barracks where there was no running water, no electricity, and no bathrooms; the workers were not allowed to leave except to cut sugar cane. Armed guards from the sugar companies kept close watch on them. However, the Haitian government received compensation in selling these men; the money never trickled down into the worker's hands. Magloire was from the rising, black middle-class in Haiti. "Kanson Fé" or "Iron Pants"), as he was known, Magloire overthrew the disastrous regime of President Elie Lescot in 1946. He later allowed the election of a liberal black president, Dumarsais Estimé. When President Dumarsais Estimé, tried to extend his term of office in 1950, with the help of a local elite, Magloire ousted him and took power. Paul Eugène Magloire (July 19, 1907 - July 12, 2001) was a Haitian general's son. He joined the army in 1930 and became Police Chief of Port-au-Prince in 1944. In 1946, he participated in a successful coup against President Élie Lescot. In 1950, while he was serving as an army general, he ousted President Dumarsais Estimé with the help of a local elite and installed himself as ruler. Before the long dictatorship of the Duvaliers which took the country back again in a period of oppression, his period of rule as president between 1950 and 1956 is marked as a period of unusual peace and efforts at modernization. Many consider Magloire's period as Haiti's golden age - during his era, tourism reached at its peak and Haitian coffee exports drew high prices. He refurbished towns and built roads, a cathedral, public square, the country's first major dam and other infrastructure projects and cultivated good relations with the Dominican Republic. Attempts were made to invite foreign investments and implement economic and social planning. Women were given voting power and direct popular election of the president was introduced. However, the good days ended in 1954 when Haiti was hit by Hurricane Hazel. The hurricane inflicted heavy damage on the economy, relief funds were stolen, and Magloire's popularity fell. After two years, he was ousted by the military and went into exile in New York. When François Duvalier took the presidency, he stripped Magloire of his Haïtian citizenship. At the end of Duvalier dictatorship in 1986, when Jean-Claude Duvalier (Baby Doc) fled to France, Magloire returned to Haiti. He was an unofficial adviser to Henri Namphy, who briefly ruled Haiti in 1988. It was a mark of appreciation for his past deed to the country. The mulattos were happy under the reign of Magloire because their shameless privilege and racism received patronage and reached the apogee of their power, and Magloire's tough stand (Kanson Fé) with the mulattos took them to a height of command and enjoyment. He restored the elites to the prominence. Henri Namphy was a Haitian general and political figure who served as President of Haiti's interim ruling body, the National Council of Government, from February 7, 1986 to February 7, 1988. He Once again served as President of Haiti from June 20, to September 17, 1988. He is buried in the Dominican Republic, where he was exiled after being overthrown in September 1988 by Prosper Avril. Chief of General Staff of the Haitian Armed Forces, Brigadier General Sadrac Saintil, represented the General Staff and the Ministry of Defense as well as Antonio Rodrigue, the Minister of Foreign Affairs was also present at the funeral to represent the Haitian government. 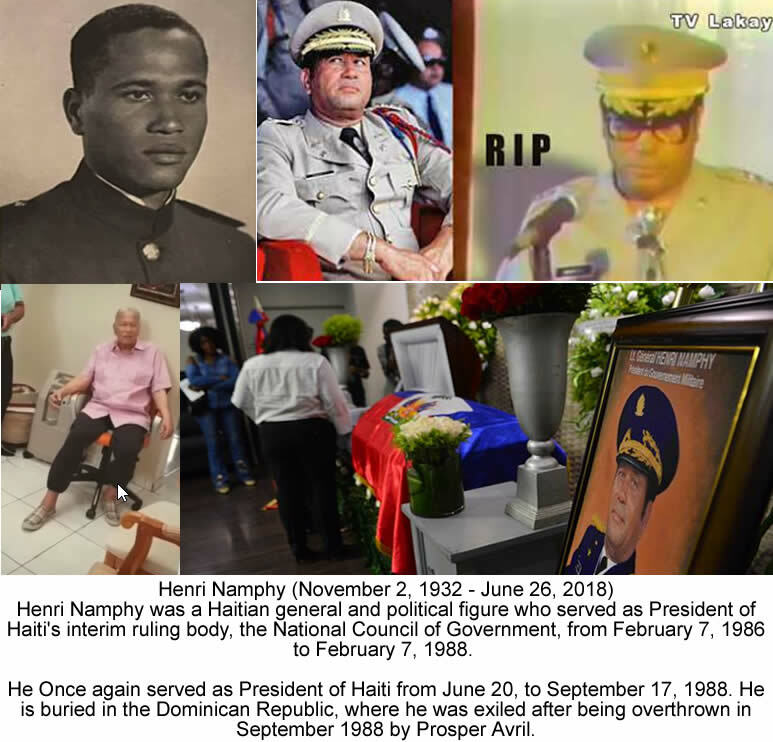 Henri Namphy (November 2, 1932), was a former Haitian coup leader and Lieutenant General who served the country in the Armed Forces of Haiti (FADH), died in a hospital in the Dominican Republic on Tuesday, June 26, 2018, following a battle with lung cancer. He served as the President of Haiti's interim ruling body, the National Council of Government, from February 7, 1986 to February 7, 1988. In February 1988, he was replaced by Leslie Manigat, elected President, who put him under arrest for insubordination. However, General Namphy's popularity and influence helped him to regain power in June 1988 where he remained until the September 1988 coup. Namphy served as President of Haiti from June 20, 1988, but was deposed three months later on September 17, 1988 in a coup d'état when a group of non-commissioned officers in the Haitian Presidential Guard removed Namphy and brought General Prosper Avril to power. Earlier, in June 1988, Namphy overthrew Leslie Manigat in a coup d'état. Manigat was elected as President of Haiti in a tightly controlled military held election in January 1988. Following his deposition in the September coup, Namphy fled to the Dominican Republic and never returned to Haiti. In 1986, when with the fall of his government, Jean-Claude Duvalier (appointed by his dying father as "President-for-Life") fled into exile in France with his family, Henri Namphy formed an interim government consisting six civilians and military members and promised elections and democratic reforms. However, his regime has been nicknamed as "Duvalierism without Duvalier". Namphy enjoyed the reputation of being honest and apolitical. As per his wish, he has been buried at the Cristo Redentor cemetery, Santo Domingo. 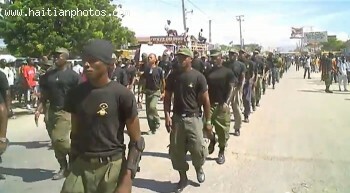 Here is a picture of some Soldiers of Haiti Corps of Military engineers as their demand to secure the country. On September 3, 2015, within the bilateral framework between Haiti and Ecuador, 40 new Haitian soldiers of engineering body were graduated under an eight months training program that started back on January 12, 2015. A Military Engineer is usually responsible for building, maintaining, controlling and sometimes destroying structures and vehicles used for military operations. They remain responsible for maintaining lines of military transport and communications and as one of the oldest form of engineering, it is also regarded as the precursor of the civil engineering discipline. The graduation ceremony was organized at the Training School of Ecuadorian Army soldiers (Escuela de Formación de Soldados del Ejército) at the Champ de Mars located at the northern exit of Ambato, the third city at the south of Ecuadorian capital Quito, in the presence of the Brigadier General, Edison Narváez Rosero, the Commander of the Command of Education and Doctrine of the Army (CEDE). The support of Ecuador to the establishment of a defense force in Haiti was decided during a meeting between the former Haitian President Martelly and his counterpart Rafael Correa while the Haitian President was on an one day official tour in Ecuadorian capital Quito in November 2014. 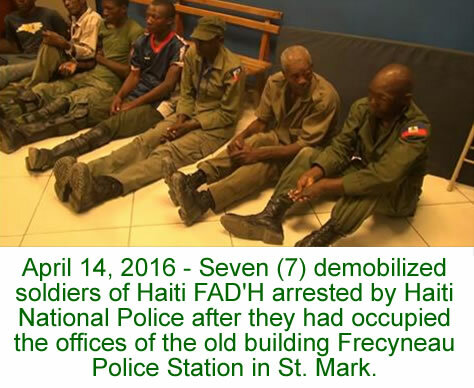 Here is the picture of the Seven demobilized soldiers of Haiti FAD'H who were arrested in St. Mark. 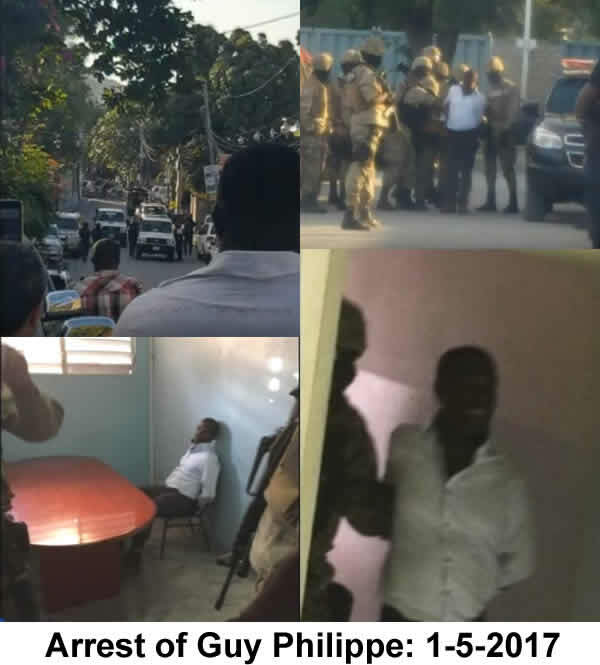 As per the announcement of Jean Joras Sydney, the Commissioner of Police of St. Mark, on April 14, 2016, the National Police of Haiti (PNH) with the support of MINUSTAH have arrested seven demobilized soldiers of the disbanded Armed Forces of Haiti (FAd'H) from the office of an old building belonging to the Frecyneau police station, in the southern part of the capital city. These soldiers were in olive green uniform and came from towns of Jacmel and Petionville. The police was alerted by the local people about the presence of these former military members. During the operation, there was no exchange of fire. They were arrested peacefully while some of the arrestees were in sleeping condition. 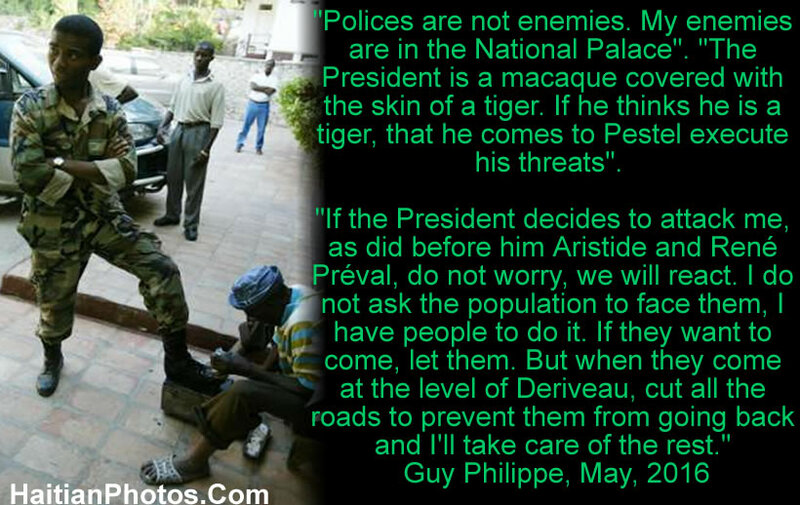 Here is a famous statement pronounced by the Haitian strong man Guy Philippe as he draws a line in the sand of Deriveau for Jocelerme Privert. "Polices are not enemies. My enemies are in the National Palace". "The President is a macaque covered with the skin of a tiger. If he thinks he is a tiger, that he comes to Pestel execute his threats". 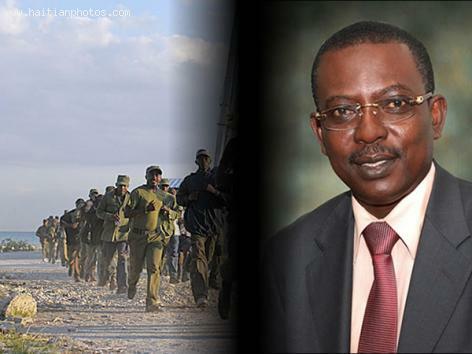 Haitian Defense Minister, Jean Rodolphe Joazile announced that Haiti will soon be forming its armed forces. He reported that this decision came after the support received from France, Brazil, Uruguay and Ecuador. He reported that the initial batch of recruits will be trained in the countries supporting Haiti and that 50 men from different backgrounds are already undergoing training in Ecuador and will be replacing the Ecuador's armed forces operational in Petite-Riviere in Artibonite. Joazile said that no labels will be attached to the armed forces because all that matters is to have Haitian armed forces who can take control and protect the vulnerable and fragile nation. It can only take place in Haiti.How is it possible for men called themselves demobilized soldiers, Remobilized Military, etc., to act with such confidence and arrogance. Who is providing security for the Haitian population? certainly, not the current forces. Is it time to come out and state clearly that the Haitian population has no security? 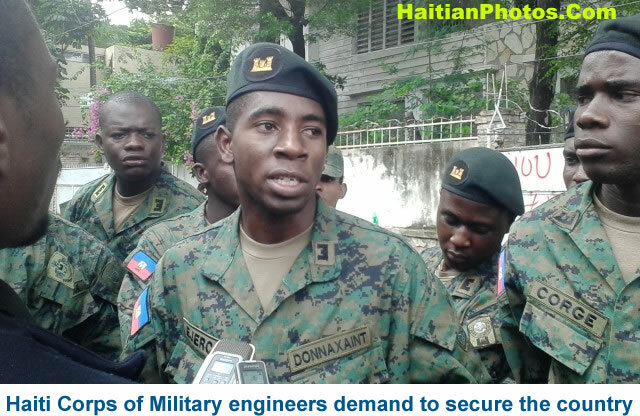 Should we say that these forces have proved incapable of handling security issues in Haiti? 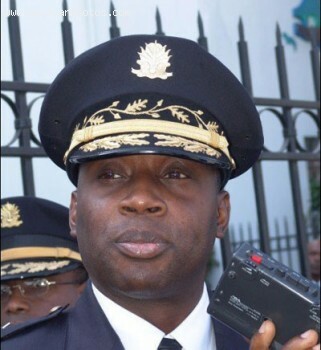 Here is a picture of Haitian police chief Mario Andresol as new allegation of police brutality just surface on a video. The Haitian civilian police force was created in 1994 by former President Jean-Bertrand Aristide when he returned to power, in order to end brutality by the military. This new video showing the current Haitian Police force involved in police Brutality does not help.